We want you informed about things that could affect your health. My name is Randy Davis and I am the owner of Designer Drugs, a compounding pharmacy in Chattanooga, TN. I have been the owner and pharmacist in charge of this business for over 13 years now. Over the past year, we have transitioned through a name change from The Wellness Pharmacy to Designer Drugs. Changing our name was prompted by another pharmacy in Birmingham with the same business name as ours. In business, you want to have a name that is unique and describes what you do best. I could have kept The Wellness Pharmacy as our business name but I decided to pursue the name, Designer Drugs, which defined exactly what we do. Plus, people would surely remember it. Choosing Designer Drugs as the name of our business has definitely been a good decision. It most definitely has been a good decision in light of the recent publicity of another pharmacy in Cleveland, TN with Wellness in its name. To be clear, there has only ever been one compounding pharmacy that I have owned and it has always been in Chattanooga. I have absolutely no association or business relation to any other compounding pharmacy; only The Wellness Pharmacy of Chattanooga which is now Designer Drugs. Designer Drugs has gone to great lengths to distinguish our compounding pharmacy as one of the elite in our area and the nation. Designer Drugs is certified to compound sterile and non-sterile products and we are approved by the TN State Board of Pharmacy. Additionally, Designer Drugs is a PCAB Accredited compounding pharmacy. PCAB Accredited pharmacies represent approximately the top 3% of the nations’ pharmacies. PCAB Accreditation is something I have extreme pride in touting. PCAB Accreditation is earned through a rigorous set of standards and procedures most other pharmacy cannot achieve. As a patient or a physician looking for a compounding pharmacy, one should only choose a PCAB Accredited compounding pharmacy. Compounding pharmacies have been in the spotlight now for a couple of years mainly due to manufacturing-like processes, inadequate quality control procedures, dispensing expired medication, etc. As the owner of a compounding pharmacy, I feel it my duty to emphasize the fact the not all compounding pharmacies are created equal. Just like not all lawyers, doctors, car dealers, salespeople, pharmacists, etc. (you get the picture) are the same. I take great pride in my work. I have helped numerous patients and physicians obtain the best treatment options for health. I am proud of what I and my team at Designer Drugs have built. While some pharmacists and pharmacy’s attract negative attention by practices that are seemingly sketchy, please know that there are plenty of pharmacy’s that do not and will never fall into this category. I am passionate about this business and I hate to see other pharmacies and compounders marred by the actions of a few; especially when the business name of the pharmacy has a close resemblance to our previous business name. Designer Drugs welcomes you to our pharmacy. You can rest assured our PCAB Accreditation was earned with your best interest in mind. 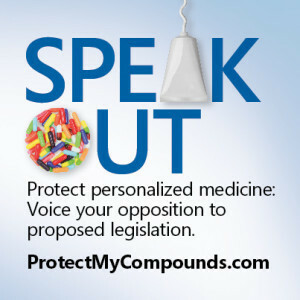 Legislation has been proposed that could create an environment that would unduly restrict access to personalized (also known as compounded) medications, even when they provide the best treatment options for patients, as determined by their physicians. You can make a difference by letting your voice be heard. For the latest House and Senate proposed bills, click here. Keep an eye out for our new and improved website. We are always looking for ways to serve or community better!